When you’re shopping for the best toys for 3 year old boys, you need to take on board a few important factors. Your little boy is way more active and adventurous now, open to new challenges, has an active imagination and boundless amounts of energy! Keeping those things in mind will help you choose toys that match his personality and fuel his imagination and creativity, as well as challenge him, give him an outlet for his energy and grow with him. To make life easier for you, we’ve researched high and low and hand-picked the best toys for a 3 year old boy. With the Vtech Little Apps Tablet your toddler can go on all kinds of learning quests with Cody The Smart Cub! This cute tablet features 12 different games and activities that will help teach your child numbers, letters, words, puzzles, days of the week and lots more. 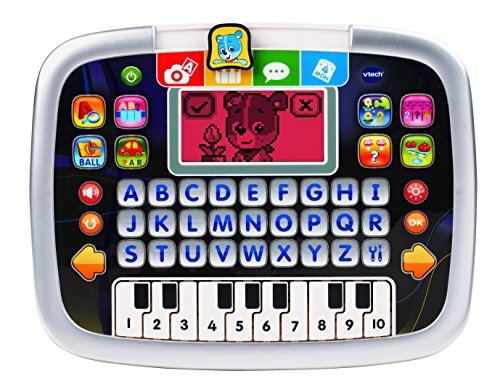 In addition, this VTech tablet also has A-Z letter buttons, a built in piano keyboard and a pretend camera and a button that changes the color of the screen. So there’s plenty for your little one to do and learn as they play along with Cody The Cub. Ideal for pretend play and stimulating your toddler’s imagination and creativity, this kids learning tablet is sure to keep your child entertained for hours. Parents love the volume control and it also comes with an automatic shut off to save on the battery. The tablet measures 2″ X 11.8″ X 9.5″ and takes 2 AA batteries (included). A great any-occasion gift idea, this learning tablet also comes in pink which makes it great for both boys and girls. Kids love Cody The Smart Cub and have tons of fun with this tablet! Th award winning Learning Resources Gears! Gears! Gears! gives your 3 year old lots of ways to develop their sorting, grouping, counting and designing skills! There are a total of 95 pieces, including all kinds of gears, square pillars, axles, interlocking bases and more. The gears come in 5 great colors – red, orange, green, blue and purple – so your child can create colorful and impressive designs. With so much variety, there’s really no end to the things your little guy can create with this fun and engaging construction set. A great STEM toy, this set makes a wonderful gift for any 3 year old. Why We Recommend The Learning Resources Gears! Gears! Gears! Kids love all the things they can build with this construction set! If you are looking for the best learning activity station for your toddler’s quiet time, then the Vtech Touch And Learn Activity Desk is definitely worth considering. 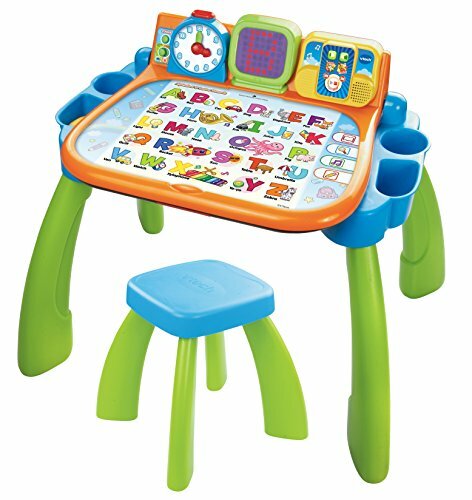 This desk will help your child learn letters, animals, numbers, people and lots more. In addition, the VTech Activity Desk gives your little one access to 160 different words, 30 fun activities, 20 melodies, 9 touch pages and 4 learning modes. The desk top flips up to create an easel or chalkboard and an LED screen shows your child how to write letters and numbers. This cute learning desk also has a convenient small mall storage space inside which can be used to store chalk or other small items. Requiring 3 AA batteries (not included), this activity desk comes with a little stool that’s the perfect size for your toddler. The Battat Take Apart Airplane is a fun and interactive toy for any child who loves figuring out how things work! This Battat toy has 21 parts that can be disassembled and then reassembled and it also comes with a toy power drill and 3 bits. The drill needs 2 AA batteries (not included) and the over-sized parts are designed with small hands in mind. 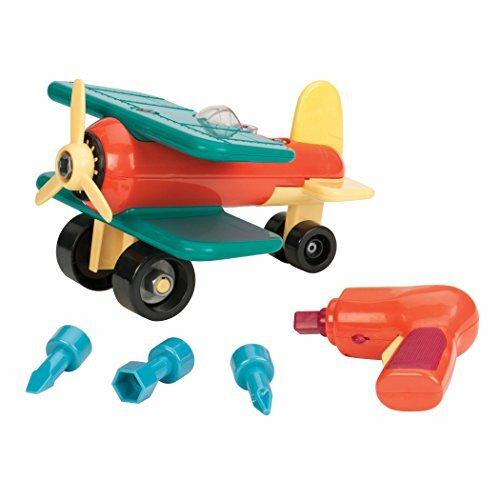 Measureing 9 3/4″ X 9 3/4″ X 6 1/4″, this take-a-part airplane may seem like it’s more suited to boys, but consumers say that girls really like it too! 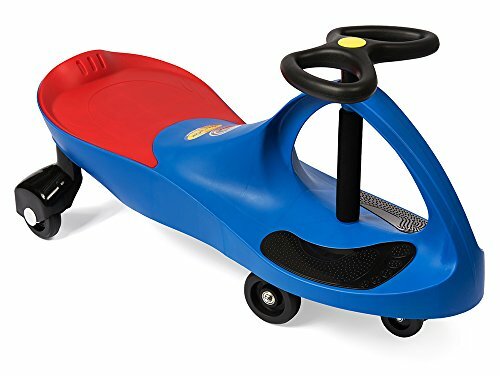 The unique PlasmaCar Ride On Toy is an awesome toy and makes a great gift for any three year old boy! It requires no batteries and uses no pedals. All your little boy has to do to move it is simply twist the steering wheel back and forth. The seat is low to ground and there’s a place for your toddler to put his feet on both sides of the PlasmaCar, making it a comfy ride. It’s a great way to develop gross motor skills, build arm strength, develop coordination and will provide your child with hours of fun! It’s quick and easy to assemble and can be used both inside and out. A couple of things to note are that the PlasmaCar works best on smooth surfaces and it can really build up a ton of speed when your child rides it downhill. If you’re looking for a great ride on toy for your little boy then the PlasmaCar is definitely an excellent choice! This green Fisher Price Power Wheels Dune Racer is tons of fun and it’s a great way for your toddler to get in on some safe driving action! Designed for outside use, the trademarked Monster Traction system allows your child to power through all types of terrain without getting stuck. That includes wet grass, mud, sand, rough roads, gravel, cement and bumpy back yards. No matter where your little guy wants to ride, this Power Wheels vehicle will get him there! With sturdy metal sidebars that kids can hold on to, the top speed of this cool ride on toy is 5 miles per hour going forward and 2.5 miles per hour when in reverse. 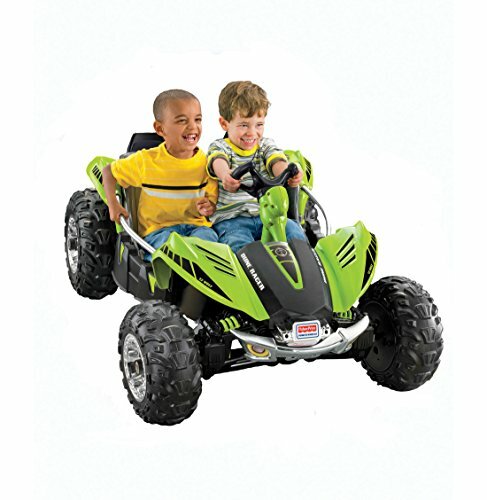 For added safety, this Dune Racer has a Power Lock Brake System that automatically stops the vehicle as soon as your child takes his foot off the pedal. This awesome Fisher Price Dune Racer is roomy enough to hold 2 kids at once and has a maximum weight limit of 130 lbs. The front hood lifts up to reveal a convenient storage compartment and it also has velcro seat belts. It comes with a 12-volt battery and charger and everything that’s needed for assembly. Suitable for both boys and girls, the Dune Racer comes in a variety of different colors including camouflage, pink and purple and red and black. The Dune Racer makes a tremendous any-occasion gift for that special three year old on your shopping list. Kids think it’s a ton of fun! This vibrant Melissa & Doug Underwater 48 Piece Floor Puzzle gives your toddler an idea of what it would be like to explore the wonders of the deep blue sea! Each piece is made from extra thick easy to clean cardboard to ensure you’ll have no trouble keeping this wonderful Melissa And Doug floor puzzle looking just like new. 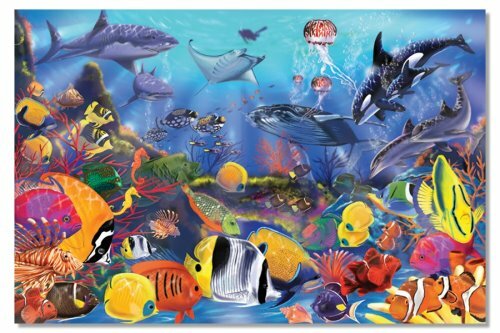 This stunning puzzle showcases all kinds of colorful fish and underwater flora and fauna and is 2 feet X 3 feet when assembled. This wonderful and fun Melissa & Doug puzzle is ideal for both boys and girls. With 12 different rooms on 3 floors, this Kidkraft Every Day Heroes Play Set is a ton of fun for your toddler! 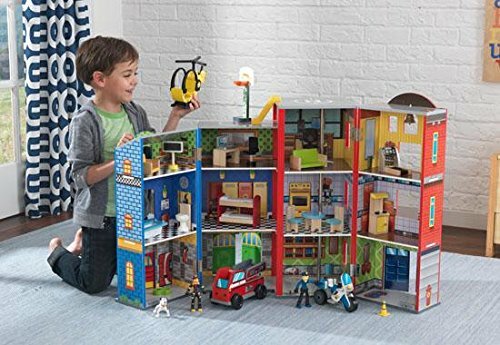 A combination fire department and police station, this wooden play set comes with 28 pieces of toy furniture, 2 bendable figures and 2 bendable dogs. Also included are 3 fun vehicles: A fire truck, a police motorcycle and a helicopter. From the incredible detail inside and out to the to the fireman’s pole inside the firehouse, your little guy will have no trouble pretending to be a real-life hero! For even more pretend play fun, there’s even a rooftop helicopter pad and basketball hoop and there’s enough room for more than one child to play at once. Measuring 38.25″ L x 10.75″ W x 27.75″ H, when playtime is over, everything fits neatly inside and the play set folds up for convenient storage. It’s very interactive and tons of fun to play with! This Melissa & Doug Deluxe Wooden Railway Train Set is a wonderful toy for any train loving toddler! It comes with over 130 pieces including lots of straight and curved track, a suspension bridge, a roundhouse engine shed, a magnetic crane, multiple piece trains and lots more! With toy train workers, traffic signs, switches and a T-junction, there’s no end to the pretend play fun your aspiring little conductor can have. Also included are instructions for how to design different track configurations. 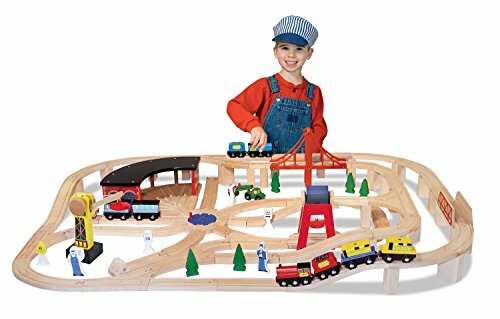 This delightful railway set is compatible with many other wooden railway sets including Thomas & Friends and Brio. This train set makes a wonderful gift for any train enthusiast. If you have a toddler who loves playing with vehicles, he’ll love this Matchbox On A Mission 20-Pack Car Set! Each detailed vehicle in this 20-pack set is die cast and measures about 3″ X 1″. Although what vehicles are included in each pack varies, the selection includes construction vehicles, classic cars, police cars, tow trucks, race cars and lots more. And as we’ve come to expect with Matchbox toy cars and trucks, each vehicle in this pack is well made and built to stand the rough and tumble world of boys. This pack is a great way to kick off your toddler’s Matchbox collection! Tons of fun to play with! They are small enough to take anywhere – great for play dates! 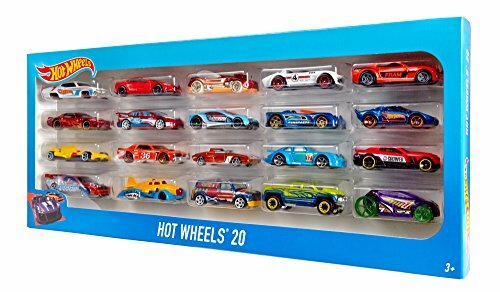 This Hot Wheels 20 Car Gift Pack is a great way to start your toddler’s Hot Wheels collection! Whether your child is playing with them on or off a track, each 1:64 scale vehicle is die cast and built for tons of fun! Including lots of awesome old and new models, your little guy will love the all the classic types of decorations and the latest revved up designs. Each 20-pack varies but the selection of vehicles available includes dune buggies, classic cars, race cars, hot rods and more. And all the vehicles in this pack are compatible with Hot Wheels tracks and playsets, including the Hot Wheels Garage. This set makes a perfect gift for any child who loves playing with toy cars and trucks. This awesome little Green Toys Dump Truck is rugged, tough and tons of fun! With its extra large wheels, your toddler can play with this cool little truck on different types of surfaces, both inside and outside. Sturdy and well designed, the bed on this dump truck can be raised and lowered, adding to your little one’s playtime fun! Measuring 10″L X 7.5″W X 6.75″H, it’s dishwasher safe so keeping it clean is a a breeze. 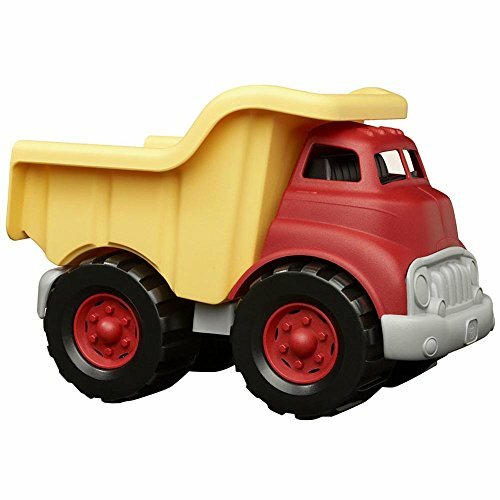 Made in the USA from recycles milk cartons, this eco-friendly dump truck is Phthalates, BPA and PVC Free. And it’s also available in pink, making it ideal for both boys and girls. If your little guy is fascinated with garbage trucks, he’ll love this Bruder Side Loading Garbage Truck! Designed to look and function just like a real one man system, Bruder has loaded this truck with lots of detail that makes it tons of fun to play with. Once your toddler has loaded a garbage can onto the fully functional grapple arm, he then uses the grey crank to raise the can up and dump the contents into the truck. There’s an orange lever on the opposite side of the truck that, when rotated, moves the garbage to the back of the truck. To dump the garbage out, your child simply opens and latches the tailgate, tips the entire truck bed up and out comes the garbage. Other fun features of this awesome garbage truck include a folding outside mirror, soft rubber tires that have actual treads and a driver’s cab that can be tilted forward to reveal the block engine. No actual garbage is included but your toddler will have no trouble making his own ‘garbage’ to throw into the trash cans. Kids use anything from LEGO blocks to rolled up or shredded paper; the only limit is your child’s imagination. Two garbage cans are included but if your little guy wants to pick up garbage on a longer ‘street’, a set of 4 Bruder garbage cans can be purchased separately. The Bruder Toys company motto is ‘just like the real thing’ and this side loading garbage truck is exactly that. It’s an ideal gift for that any truck loving guy on your shopping list! 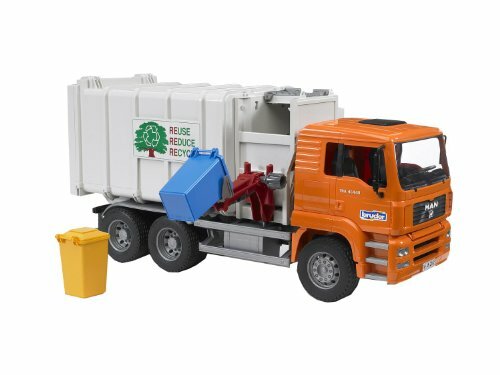 This model size garbage truck is made from light and durable ABS plastic, has no screws and can be played with inside or outside. 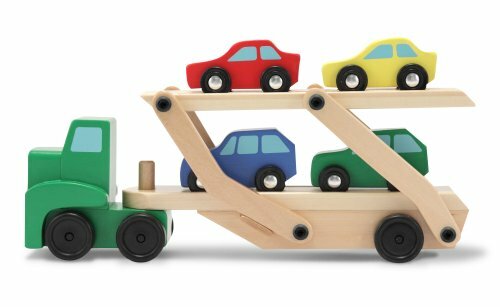 This Melissa & Doug Car Carrier Truck & Wooden Car Set is sure to be a hit with any 3 year old boy! This playset includes 4 colorful cars and a sturdy double decker truck. 2 cars fit on the upper level and 2 on the lower level. The upper level is a folding ramp that your little guy can swing backwards to lower. The wheels on all the cars actually move so he can drive each car onto the ramp. Once they’re loaded, he simply swings the ramp back up and he’s ready to hit the road! Other toy cars and trucks can be loaded onto the ramps and the trailer that carries the cars can be unhooked from the truck so the pieces can be played with individually. Each piece is easy to manipulate, is just the right size for small hands and it measures 5.75″ x 12″ x 3″. There’s something to be said for toys that require no batteries and the only sound they make comes from your child. And this wonderful Melissa And Doug toy falls into that category. Whether he’s using the included wooden cars or is loading other toy cars and trucks from his collection, your little guy is sure to have tons of pretend play fun with this Melissa And Doug toy! If your little guy is ready for some riding adventures, check out this awesome Harley Davidson Tough Trike! Made by Fisher-Price, this trike has a wide wheel base which makes it extra stable for your toddler. Plus the large non-slip foot pedals, easy grip handlebars and wide seat ensure a safe, fun and easy ride. The large rugged plastic wheels can get over different types of terrain including pavement and grass plus it won’t scratch hardwood floors if your toddler rides this trike inside. There’s a pretend key that clicks when it’s turned and the spacious storage compartment under the seat allows your child to haul around toys or his favorite stuffie. 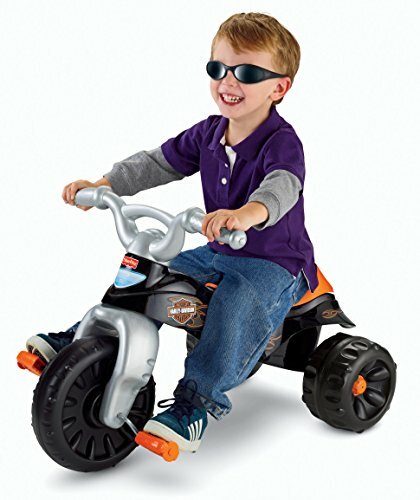 With the authentic Harley Davidson logo and design, your toddler will love showing off his decked out new ride as he pedals around the neighborhood with you at this side. This cool little trike is easy to assemble and although it’s purchased mostly for boys, lots of little girls also really enjoyed riding it. 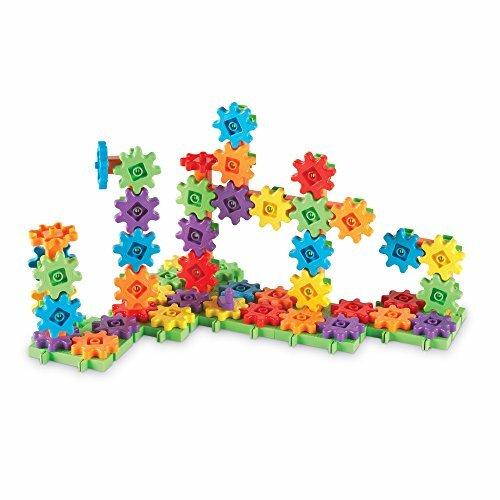 The Magnetic Stick N’ Stack Tiles 100 Piece Set is ideal for any three year old boy who loves building! 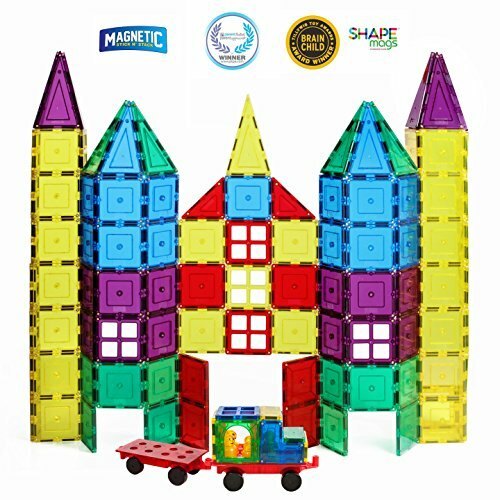 An alternative to traditional building blocks or bricks, this construction set has magnetic tiles that your little builder can easily connect together. And once he’s done building, the magnetic tiles hold together well so he can play with all of his creations. The brightly colored tiles come in different shapes and sizes, including triangles and squares. Plus there are also vehicles bases with wheels included in this fun building set. The tiles have magnets on all sides so your toddler can use them to create all kinds of cool vehicles and buildings! And because the tiles are magnetic, your toddler won’t have to worry about his creations falling down before he’s done. Although there are no instructions explaining how to build specific structures, this set does include tips on how to build things. So the only limit is your child’s imagination! It’s easy to picture your toddler starting out by building simple vehicles and small houses and then graduating to more complex creations. And this set can be added to other magnetic building sets, allowing for even more building fun and creativity. There’s simply no end to the building fun your toddler can have with these Magnetic Stick N’ Stack Tiles! Kids think it’s a ton of fun and love how many different things they can create with this set! Can be used with other magnetic building sets, increasing the number of things your child can build and adding to the fun!